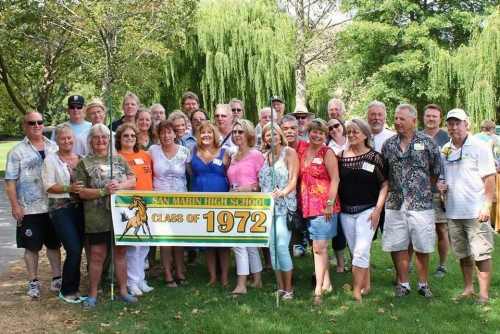 San Marin High School Reunion - Reunion of the 1970's! Photos from the 2011 reunion are here for your viewing pleasure, but we will be looking for memories from the 2013 event! Please upload your pictures for us all to enjoy! Three albums have been added for 2013: Reunion 2013, Friday Night @ Viking, Reunion 2013 - Vol. 1 and Reunion 2013 - Vol 2. Make a comment when you post! The pics from 2011 from Friday night/Sunday brunch and the golf album have been moved to the August 13, 2011 - Volume 4 album. There's room for ~600 new photos, so more albums can be created if needed and there should be plenty of room! Please submit the pictures you take at the reunion (or some of those "ancient history" snaps you've got hidden in the drawer if you can, to the "Oldies but Goodies" album). Please IDENTIFY who's in your photos! Thanks!